As animal lovers, we love and cherish all our pets. But certain dogs (and cats) change us – they get under our skin, deep in our hearts, and our spirits are forever bound. Heart dogs enter our lives in unexpected and wonderful ways. Sometimes our time together is brief, but they shape our lives and lead us to places we never could have imagined. They live on in our hearts and we see the world differently, more vividly and clearly because of the bond we shared. Disclaimer: This post contains affiliate links. If you order through the link below, I will receive a small commission and be very grateful. Treasure. Used with permission of Debbie Bauer. The summer after her high school graduation, Debbie worked in a local kennel. There was a deaf and blind collie named, Lady. The kennel staff provided her with food, water and shelter in an outdoor pen, but otherwise ignored her. Although Debbie had no prior experience with blind and deaf dogs, she was instantly drawn to Lady and they formed a deep bond. Debbie spent every moment she could with Lady, grooming her, teaching her tricks, and showering her with affection. At the end of the summer, Debbie asked the kennel owner if she could purchase Lady. The kennel owner declined her offer, telling her that Lady would have surgery to make her eyes “look normal” and then be used for breeding. Debbie was heartbroken, but vowed to learn as much as she could to make a difference for other blind and deaf, double merles. She has kept her promise and gone on to write two books and now travels the country providing training, education and support for these special dogs. Because of her bond with Lady, she has devoted her life to changing hearts and minds and saving other blind and deaf dogs from suffering a similar sad fate. Treasure, the therapy dog. Photo used with permission of Debbie Bauer. 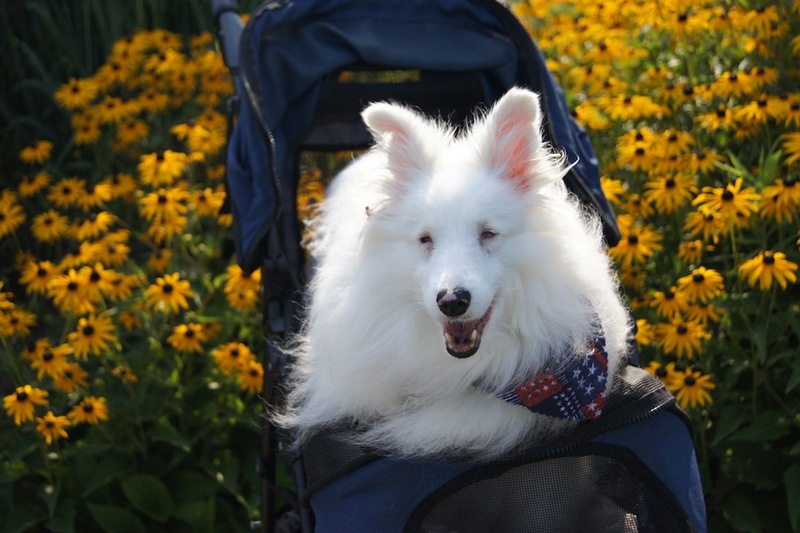 Treasure is a ten-year-old, deaf and blind double merle* sheltie. She is also a semi-retired therapy dog, a READ Program Dog, and has her AKC Canine Good Citizen Certificate. Additionally, she has earned several expert trick dog titles, loves canine nose work, and travels around the country with Debbie providing training and education. Debbie first discovered Treasure listed on Petfinder with a shelter in Missouri. Although she lived in Pennsylvania at the time, she contacted the shelter and offered to adopt her. Unfortunately, there was already an adoption in progress. Debbie was disappointed but happy Treasure had a home. A few months later, she saw the same dog listed for adoption with a rescue in Maryland. Knowing it was meant to be, she followed her heart and soon brought Treasure home. Treasure was adopted at age four and is now ten. She is quiet, calm, and takes everything in stride. Vegas. Photo used with permission of Debbie Bauer. Debbie found Vegas through a Sheltie rescue group who arranged transport for him from Nebraska to Pennsylvania. Vegas is four years old and was born deaf and severely visually impaired. Debbie believes he sees some large shapes and movement close to him. Although reserved with new people, at home Vegas is a lover boy, always happy, dancing, and wagging his tail. Like Treasure, he also has his expert trick dog title. Debbie’s newest family member is Vinny, a six-month-old, double merle collie, born completely deaf and blind. He came to Debbie through a local family who bred their two collies not realizing they were both merles. Two of the puppies in the litter were double merles. Vinny’s sister is blind, but can hear a little and was adopted by another local family. Debbie describes Vinny as a typical puppy; bouncy, playful, and mischievous. He is doing very well with tactile marker clicker training and loves learning new things. Vinny. Photo used with permission of Debbie Bauer. Although safety is always her primary concern, Debbie strives for balance and tries not to be too cautious. While it is normal for humans to protect dogs who are different, it can also be damaging to create a sense of helplessness. Debbie believes in letting her dogs be dogs by creating a supportive environment that allows them to be independent yet still safe. In terms of training, she gives her dogs cues by touch with different locations on their bodies representing sit, come, stay, go for a walk, etc. Additionally, she uses scent cues for various places and experiences through conditioning and repeated exposure. Family portrait. Photo used with permission of Debbie Bauer. Debbie stresses that adopting a deaf and blind dog is a major commitment and should not be done without careful consideration and planning. Many dog lovers have wonderful intentions and want to save a dog that might not otherwise have a chance. While this is certainly noble, it is important to think long-term and make sure you are prepared for the special care that may be required. When Debbie adopted Treasure, there were very few resources for training and living with blind and deaf dogs. Through her work as an educator, trainer, and author, she has helped change the perception of these dogs and impacted and saved hundreds of lives. For more information on her work with blind and deaf dogs, please check out her book Through A Dark Silence: Loving and Living With Your Blind and Deaf Dog. Vinny, Treasure, and Vegas are part of The Specials, an award-winning blog series focusing on special needs pet adoption. Senior pets, those with chronic medical issues, behavioral or temperament concerns as well as overlooked or misunderstood breeds like Pits and black cats. If not for the courage and compassion of their adopters, many of these animals might have been euthanized in shelters or died alone and hungry on the streets. You can read more special needs adoption posts here. If you enjoyed this post, please see my posts on adopting deaf dogs and adopting a blind therapy dog. *A double merle is created when two merle dogs are bred together. 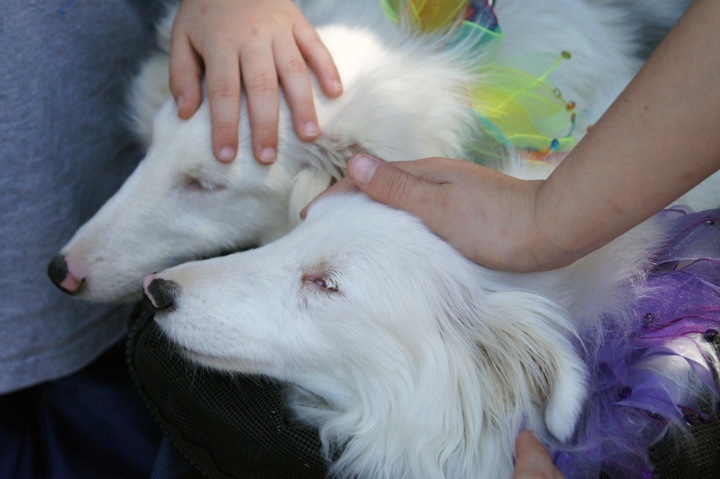 If two merle dogs are bred together, each puppy has a twenty-five percent chance of being double merle. Double merles have a high chance of being blind, deaf, or both. The following breeds carry the merle gene: Australian Shepherds, Border Collies, Cardigan Welsch Corgis, Chihuahuas, Cocker Spaniels, Collie (rough or smooth), Great Danes, Old English Sheepdogs, Pomeranians, Pyrenean Shepherds, and Shetland Sheepdogs. Sadly, many are killed at birth for being white. Many others end up in shelters or used as bait dogs in fighting rings when the buyer discovers they are blind, deaf, or both. Debbie and her furry crew are incredible. It is simply amazing what our furry companions are capable of, no matter their circumstances. And they can teach us so much. Many, many kudos to Debbie for never giving up, and for pursuing her dreams of giving these beautiful souls the lives they deserve. Thank you so much for sharing this beautiful story! Hooray for Debbie and the wonderful heart she has. I do hope that kennel owner with Lady rots in hell. How fascinating! I have always been interested and drawn to deaf dogs. I don't know why but I would love to own one some day. I can just imagine the connection Debbie must have with her dogs. You don't need eyes to see a soul.Thank you so much for sharing this. We read her blog, and we are grateful that she is educating people about double dilutes. What a beautiful story of love and devotion. Wow….thank you for sharing we were not familiar with Debbie or her book. We'll check it out.Hugs madi and mom!! This is beautiful. And to think my seeing and hearing Doberman failed CGC 3x. I am glad you are spotlighting this wonderful category of "specials." Debbie is wonderful! She has taken her passion, rescued more and is helping with resources for others. I just purchased her book as Shasta is showing signs of hearing loss and had early signs of cataracts. Once again Kristin what a beautiful post shining light on our special needs fur friends! Thank you! Debbie is a special person. Paws up to her! We sure do thank Debbie for all her hard work with these dogs. I sure would like to get her book and will go purchase it. I do have a deaf cat and so know a tiny bit but to have one blind and deaf must be a real challenge. I sure would love to have a dog like that just to help some dog, but at the moment I have too many animals and can't afford any more. What a great story. People like Debbie restore my faith in humanity. Thank you for sharing her story! What a heart warming story of a very special lady and her beautiful dogs!! I feel sorry for Lady because I know she was going to spend her life not being treated kindly. I dunno if I could have left her but I thank Debbie for finding a place in her heart for the others. We really applaud the people who handle deaf and blind dogs and even involve them in dog sports. They can lead very full lives but it is a huge commitment.